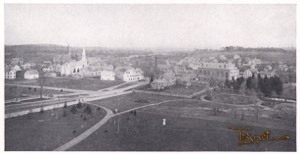 1880 Photo Memorial Square from Whitin estate. 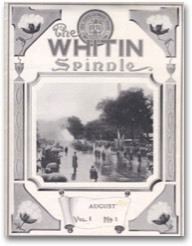 The Whitin Spindle changed formats over the years. Anyone growing up in Northbridge Massachusetts prior to 1980 lived in a true factory town. Whitin Machine Works was the heart of not only employment, but much of life in town. You will see in these magazines just how much it was a part of life for the residents. It was a time when company loyalty worked both ways. This is a rare thing today. It wasn't too unusual for an employee to celebrate 40, 50 and even over 60 years of employment! 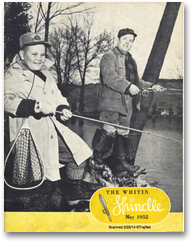 The Whitin Spindle was published by Whitin Machine Works of Whitinsville Massachusetts as a company periodical. It was issued to the employees on a monthly and bimonthly basis. Publication began in August 1919. 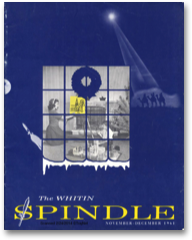 The collection contained on this website is the beginning of my effort to make the Spindle available to current and former residents of Northbridge or anyone interested in seeing life in a bygone New England factory town. You are free to download the magazines. However, if you use any images from this website, please credit TrajNet.com if you publish on the web. I have spent many hours making them available to you, so it’s only fair. Some issues are still needed to include on this site. The magazines are carefully scanned by hand using a flatbed scanner. If you have issues that are not yet part of this collection and would like to lend them to me, I and others like yourself would be grateful. You will be added to the list of Special Contributors below. Please contact me at HiDE. I’m old enough to remember my father receiving the Spindle in the mail. Back then, it was a minor curiosity for me. It wasn’t until years later when I saw some old issues at the Northbridge Veterans’ Hall that I got the idea of sharing them. I’ll admit that I’m a geek. One of my past times is creating web sites. 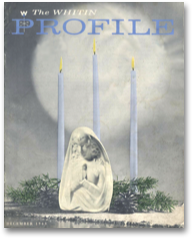 I decided that if I could get my hands on more issues of the Spindle, I would scan them and create a site to view them. I’ve worked in public service long enough to realize that many people share my interest in our local history. Since starting this project, I have noticed that the town library started a similar mission. I admit I felt a little discouraged as I don’t have the resources that they have. But I still have the drive to finish it and this site was done without any public funds or taxpayer money. It is done with a lot of heart. Don't forget to visit the World War II page. You're bound to find family in the Newsletters seen there! 1. The Search Box below is designed to search all the issues at once. Ideally, it is for NAMES ONLY. Seaching something like “articles about Al Jones” will most likely result in failure. Once a match is found, it will display a line or lines which show which issue(s) contain that name. You should then go to the appropriate issue(s) and open the issue indicated. Keep in mind that names were misspelled often, especially in the 1920’s. Don’t be discouraged if your search comes up empty. The only true way to succeed is to search with your eyes! 2. Once you open an issue, you will then initiate a second search of the issue you just opened. On your keyboard press CONTROL-F and put your search word in the field. HINT: Start your search with a LAST NAME only. Using several words will usually result in failure. If there is a match, you will be brought to the first instance of that match. It will be highlighted. You can then go on to the next match. The database is updated almost daily, so come back often! You can skip step 1 and search issues individually if desired by following step 2. Select the decade below to view, then click on the thumbnail to view that issue. Here's another cool item! Special Contributor Harry Baszner lent a unique "Journal" for this site to share with you. According to Harry, this journal was compiled by Jim "Gummy" Montgomery from January 1890 through January 1946. The journal provides a peek into the past goings on with the Shop and the town. It was scanned in color to preserve the original coloring of the paper and the Mimeograph print. See it here.